The first stop is at the same place where departing passengers were dropped off, on level 2; take exit 23. It is possible that the bus waiting at the stop has a ‘no service’ sign - then the driver is having a break. About 10 minutes before the full hour the passengers are allowed to put their suitcases in the luggage compartment and board the bus. You can buy your ticket from the driver for NIS 16 p.p. Exactly on the full hour the bus will depart from the bus stop, and will not wait for late comers! First stop: Terminal 1; when there are no passengers to board the bus, the driver continues to the next stop: Airport Authority. The next stops are announced in Hebrew only. 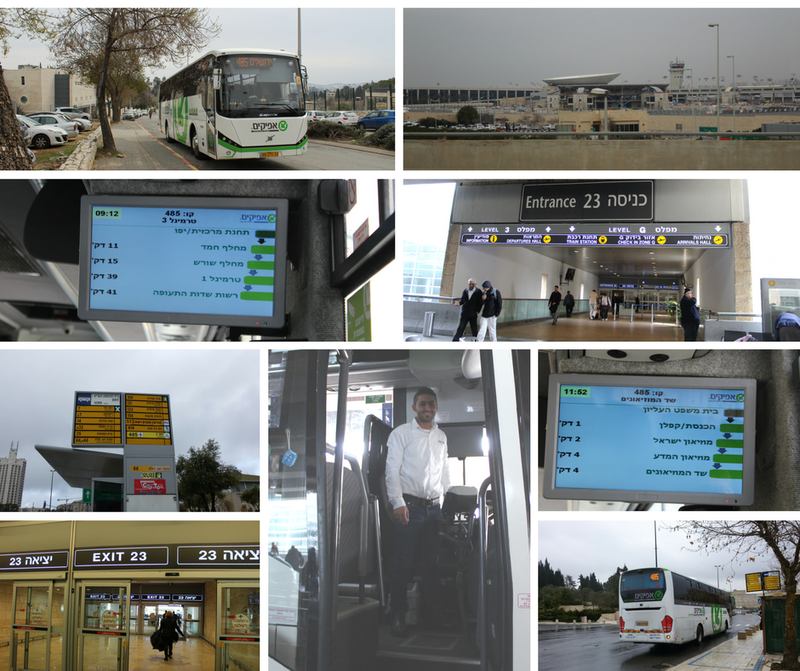 Next stop: Jerusalem - Binyanei HaUma, Shazar - for CBS passengers, light rail connection. NOTE WORTHY FACT: Not many bus drivers speak English. If you don’t understand Hebrew and are not sure where to get off the bus, ask another passenger. NOTE WORTHY FACT: City center passengers have to alight here. Be forewarned about a long and heavy ‘shlep’ to the CBS and/or Light Rail station. Passengers have to go down the ramp, through the tunnel under the main road, go up again on the other side of the road and then then walk a distance to CBS or Light Rail. NOTE WORTHY FACT: From 3 p.m. until the early evening hours the light rail is usually packed with people, which will make it a very uncomfortable experience when you have several pieces of luggage. Advice: take a taxi from the Binyanei bus stop. Final stop: Sderot ha Muzeonim. The first stop is around the corner, on Derech Ruppin, opposite the Prime Minister’s Offices.